Cringe when I think about how much I've wasted because I didn't know how to use something properly and didn't take the time to find out. This card provides two examples -- Ranger Glossy Accents and the Cameo/Silhouette. Ranger's Glossy Accents How many bottles have I tossed? Love this stuff, but the tip clogged every single time. I'd stick pins in the top, trim the top, run the bottle under warm water, etc. Nothing worked and I'd ruin the bottle. I would buy more thinking that somehow a new bottle would be better. No, I was the problem, not the product. Finally, asked on Facebook for advice and someone pointed out that Jennifer McGuire has posted that the way to avoid a clogged tip, is to use it, and then tap the bottle until the glossy accents recede out of the tip into the bottle. If any remain in the tip, push out, tap and repeat until the tip is clear. See that glossy joy above? Sometimes it takes a little patience, but so far I've used my one bottle repeatedly and have had no reason to toss it off the terrace. Although this tip is obvious, we can save money slowing down, reading directions, and getting (and following) advice! HUSBAND'S COMMENT: Oh, pink. For Christmas. That's different. Edited to add: At Taheera's suggestion, I'm entering this into the Cure for the Monday Blues challenge that she hosts every week. You can find it here. Thank you for sharing the glossy accents tip. I had read it somewhere but didn't remember where or what the tip was. I like your pink Christmas card; it's very fresh and bright. Gorgeous card and great tips too! Love all your thoughts and advice. Knowing I have a bottle of Glossy Accents sitting on my craft table right now...but not sure if I've opened it yet; or just bought it in ANTICIPATION of needing it for a Christmas card idea I have. Hopefully it is new and unopened or I fear it will land in the trash because I surely do not remember being that careful to clear the tip before! I think the card you made is really, really beautiful! As usual you made me smile. :) I love your joy card it is absolutely beautiful. Thanks for the tip about the glossy accents! I think you've solved a problem for me! Your card is awesome! 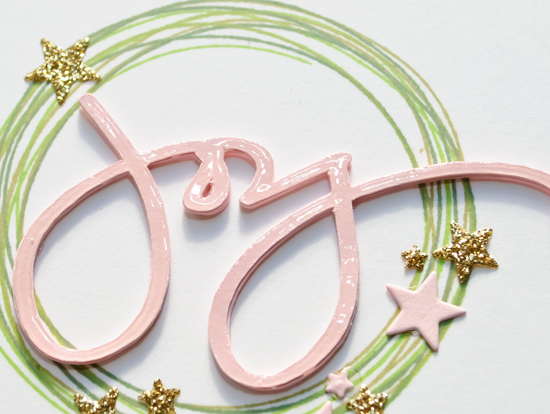 I absolutely love the shades of green circles and the way "joy" fits perfectly...and all those pink and glittery stars are just the right touch! This is a winner in my book! This is very beautiful. And, I must confess to having trouble with Glossy Accents and not reading directions. Who knew that the answers to my problems were as simple as reading instructions? LOVE this card!!!!! Recently bought some other Ellen Essentials stamps. Put Bokeh on the wish list. Must have it now! Oh, Joan--clean, fresh, and LOVELY! I think pink is *perfect* for Christmas--well, for pretty much any time! ;-) I need to try that with my Glossy accents too. I do put a needle in the tip, but the needle gets black and gunky. Maybe it's because I haven't tapped the bottle to get the GA out of the tip first though. . . Hmmm. Love it! perfect cut... perfect composition! Hehe... smiled at your husband's comment... I wonder if mine would have noticed! Beautiful card, Joan! Love your commentary! What a wonderful, beautiful creation!! I found Jennifer's suggestion about Glossy Accents 3-4 months ago and haven't had a clogging problem ever since. She has so many terrific suggestions. Love her videos. Absolutely love this! Great CAS design! Great tip for glossy accents, too. I usually leave mine upside down and it works okay. Seems I always waste a little getting it going each time, but it doesn't clog too much. Oh, my gosh! This is SO beautiful! SO much to love in this simple design. You get better every day! The sprinkling of stars is a perfect arrangement, and the pink, gold and white such a pretty combo. Dang, I love the simple wreath, too. I would probably never look at that stamp and realize its potential. Amazing! Thanks, too, for sharing what you learned about the Glossy Accents. I've been through all the same trials, but I know now what to do with the next bottle. Stellar photograph, too, by the way! I can't wait to try your glossy accents tip. I too have had the issue. I also have a lot of problems with holes and bubbles. I recently read that you should absolutely NOT shake the bottle. Can't wait to try that too. Oh my sweet Lord, I'm so glad you slowed down because this card is an absolute beauty! I love that color combo for Christmas. An absolute stunner of a card Joan! I am crazy for the simplicity yet perfect placement of every element - and you already know that I approve of the Glossy Accents! *wink* Thanks so much for playing to find a Cure For The Monday Blues! Love this post! I have the same issues with my cameo which is quickly collecting much-too-much dust for being such an expensive toy. I'll order a new blade and give it a go again. Your card is absolutely gorgeous and pink for christmas rocks. This is a very pretty card. I love that it is pink and green. Thanks for the glossy accents tip and I'm definitely going to try that. My money pit peeve is buying into a trend that I'm sure I'm going to do and like and then I either don't do or don't like. I'm getting smarter though and better at recognizing what I will and won't do when it comes to crafting.